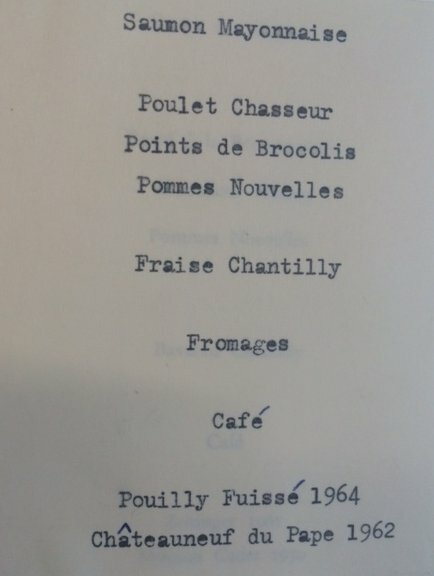 On 13 June 1967 students, staff and guests sat down to a dinner of salmon, chicken, strawberries and cheese accompanied by Pouilly Fuissé 1964 and Chateauneuf du Pape 1962 to celebrate the opening of LSE’s second hall of residence. 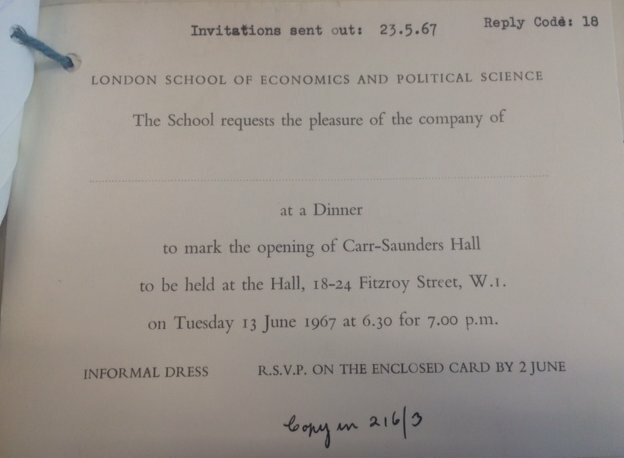 LSE Archivist Sue Donnelly shares the story of the founding of Carr-Saunders Hall. The development of the hall was far from straightforward. In 1960 an anonymous donor gave the School a donation of £300,000 for a hall of residence if work could begin within three years. Unfortunately finding a site for the new building proved difficult and when, with the help of the lawyer Sir Edwin Herbert, a School governor, a site was found in Fitzroy Street, London County Council refused planning permission for a student hall rather than ordinary residential purposes. The School appealed to the Minister of Housing and Local Government who decided that permission should be granted. The planning issues had delayed work on the final plans but work began at the end of 1964. The building was designed by Cusdin, Burden and Howitt, who also designed Clare Market. The total cost was £410,000 – most provided by the donor with £100,000 from the University Grants Committee and the final £10,000 being an advance on the general School funds. The Friends of LSE paid for the furnishing and decoration of the common room. The hall provided accommodation for 143 students. The hall was named after the sociologist Sir Alexander Carr-Saunders. Carr-Saunders served as Director of LSE from 1937-1957 and had arranged the School’s evacuation to Cambridge prior to the outbreak of war, ensuring that the School was in touch with its London base and could continue teaching across all of its subject areas. Carr-Saunders retired in 1957 and died in October 1966 after trying to push his broken down car up a hill in the Lake District. On 8 November 1966 the hall’s first warden, Dr Kurt Klappholz, was appointed on an honorarium of £450 per year. He was to move into the hall with his wife and two children. Klappholz, an economist, was born in Poland and had spent most of the war in concentration camps. After the war he came to England and studied at LSE from 1947-1951 obtaining a first class honours degree. He was naturalised in 1951 and appointed as an assistant lecturer in Economics in July 1954. The building was handed over to the School on 20 February 1967. Furniture arrived on 13 March, and the hall opened to students for the summer term of 1967. Initial plans for an opening ceremony were shelved after a year of student unrest. However the hall did host an opening dinner on 13 June for students and guests. The invitation noted that the dress code was “informal dress”. The guests of honour were Lord Murray of Newhaven, former chair of the University Grants Committee, who represented the anonymous donor, and Sir Alexander Carr-Saunders’ widow, Teresa. The host for the evening was the Frederic Harmer, vice chair of the Court of Governors. 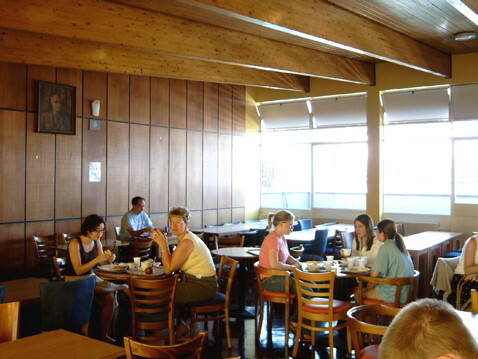 Today Carr-Saunders Hall is a catered hall with space for 160 students. In the summer of 1967 I was an examiner in “A” levels GCE of the University of London, with a set expenses fee for those obliged to stay overnight. Carr Saunders Hall was ideally placed and during vacations very cheap. In that period its facilities were far superior to very many of the hotels etc. around Bloomsbury and central London. It was possible to be very comfortable, well fed and stay well within the fee figure.